‘This photo was taken just hours after we met Esther for the very first time. She was really timid, her nails had been painted, and she wore a tattered pink collar. She looked so sad, and we were determined to fix her. As far as we knew, Esther was a “mini pig”, and as you can see it was easy to believe that to be true. We fell madly in love with our little mini pig, and she immediately became part of the family. 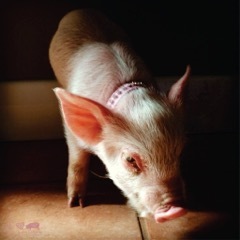 Then a bombshell hit when her vet told us “She’s no mini pig, you’ve got a commercial sow on your hands!”. We didn’t know what to do with ourselves, for days we barely talked about it, but before long we had to address the ever larger “elephant” in the room.